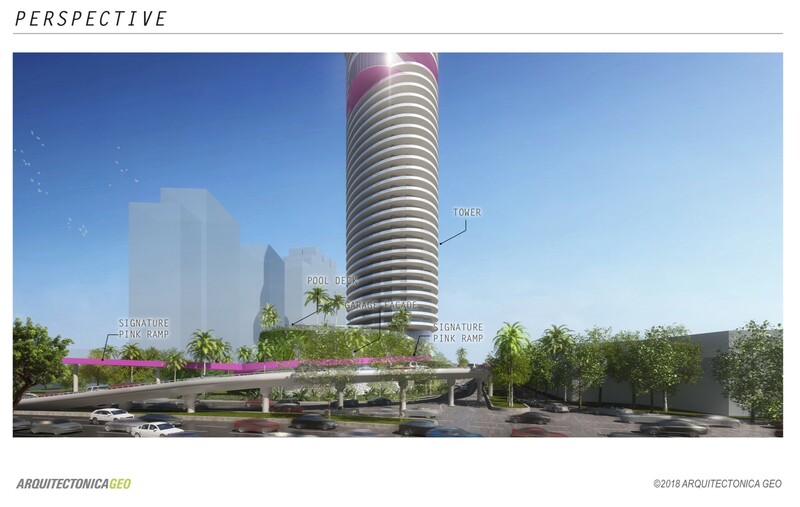 Developer Russell Galbut this week presented his vision for his 500-700 Alton Road project which includes a 560-foot tower and a 3-acre park to be given to the City of Miami Beach. Despite neighbors who spoke in favor of the plan, City Commissioners on the Land Use and Development Committee weren’t willing to support a height above 500 feet, opting instead to recommend a 44-story tower rising no higher than 484 feet. When the 560-foot number was placed into one of the draft zoning ordinances to allow the project to proceed, local activists who had reached agreement with Galbut and the City on a 44-story tower – and then expected a height of 440 feet – sprung into action. Item sponsor Mayor Dan Gelber was forced to comment on it, saying at an earlier Commission meeting that he would not support that height but that he wanted the Land Use Committee and Planning Board to weigh in with what they think the height should be. 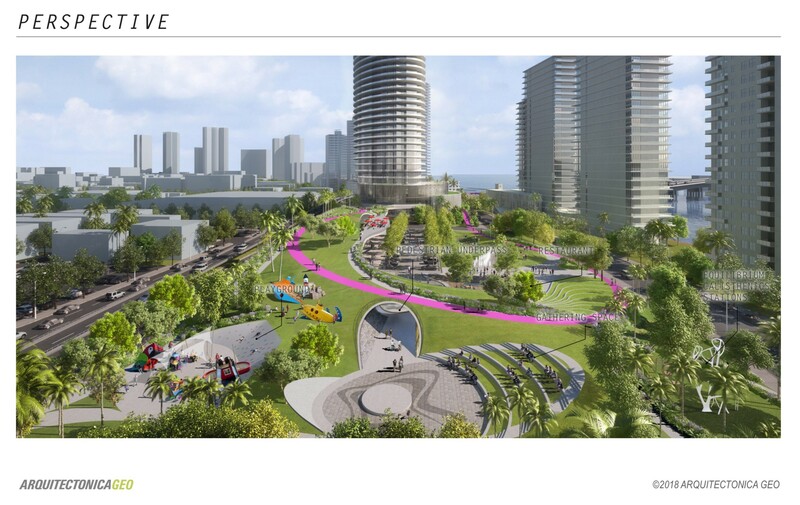 Galbut presented his plans (some of the renderings appear with this article) for a 3-acre park that the City will own but noted the area feels larger when viewed together with the adjacent privately-owned green space. 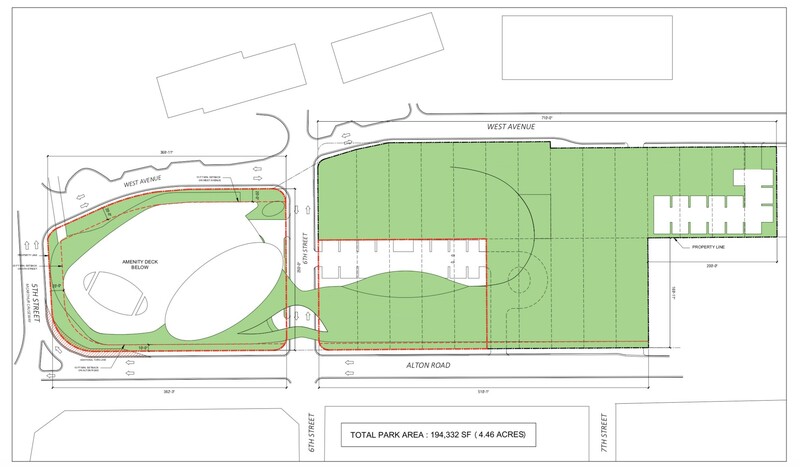 The park, which Galbut would construct before turning it over to the City, would include a children’s playground, splash pad, dog park, and walkway around the periphery of the site. 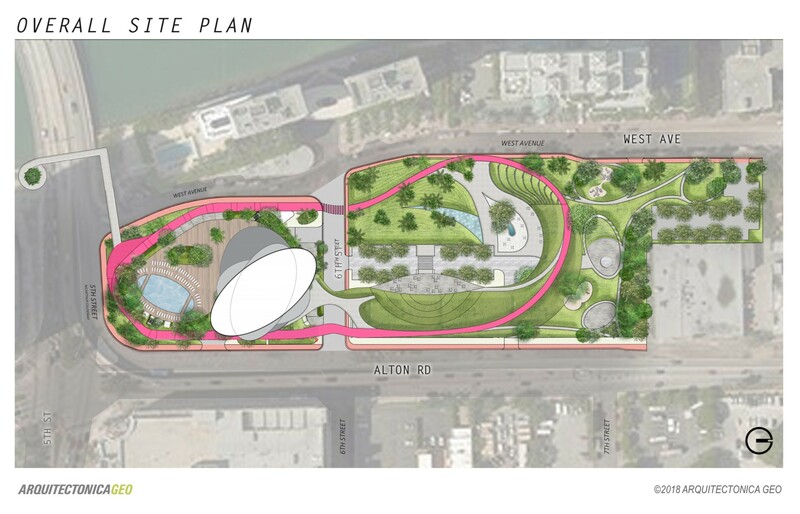 The path, in the future, can be used as a Baywalk connector over 5th Street. 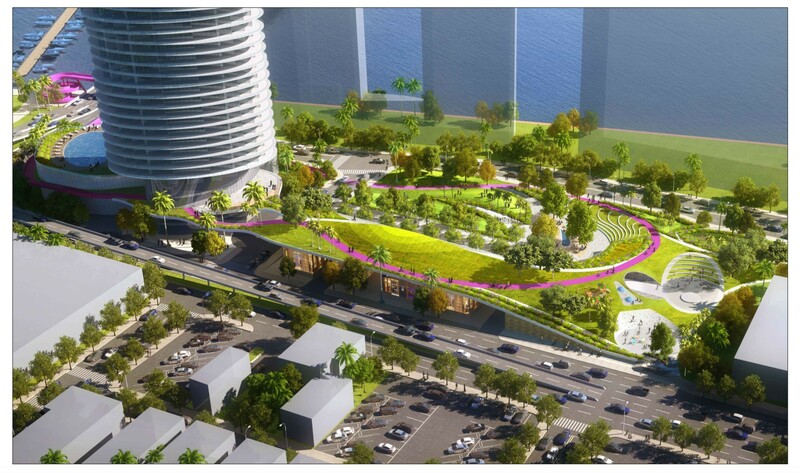 Funding for the Baywalk connector is in the General Obligation (G.O.) Bond offering to be considered by voters in November. Part of the path would go through the tower proposed for the 500 block. 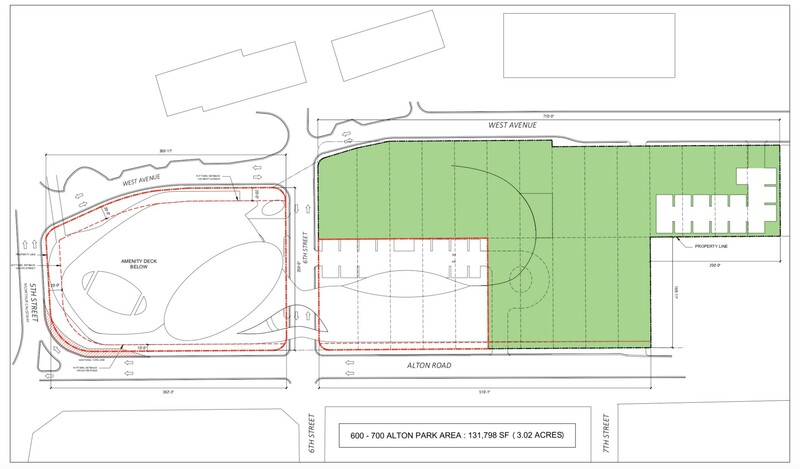 Moving the FAR (floor area ratio or density) from the other blocks into the tower opens up the area for the park and is the basis for the zoning ordinances that the Commission would need to approve. Galbut noted the project does not require additional FAR, which would need to be approved by voters, but rather that the FAR be accumulated in the 44-story tower. 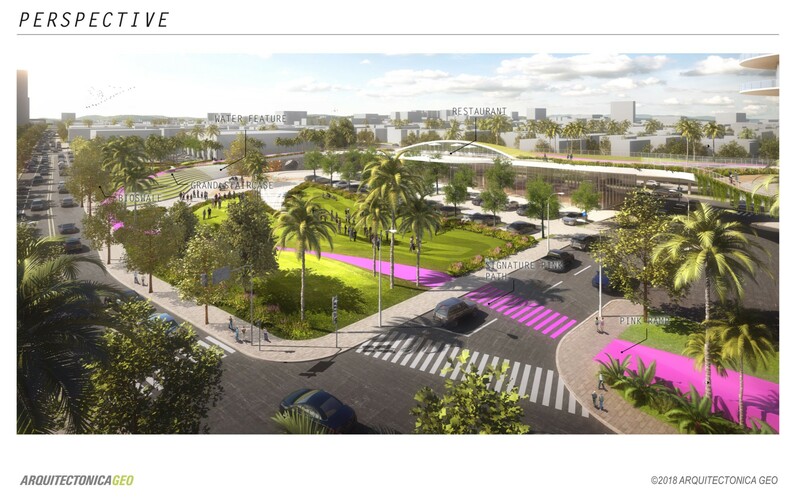 Galbut said he is creating the “largest permeable space in Miami Beach with embedded water management and retention solutions including the ability to retain water in the event of an acute shock, resilient landscaping, berms, and bioswales. In presenting his argument for the height, he said, “Height is defined by the amount of floors” which, he said, in the City of Miami and Miami-Dade County is interpreted as 14 feet per floor inclusive of slab. His plans call for four floors of parking with 10 feet in height, an amenity floor/pool floor with 24 feet in height (“typical for Miami,” he said), 20 floors with 11-foot ceilings and 10 floors with 12-foot ceilings (with about another 8 inches for mechanical, etc.). “We’re comfortable with 44 stories,” he said. As someone who represents developers as well, Martos said he understands that 14 feet per floor is required in high-end developments. He said “We want a high-end product” for this project. Janet Silverman, representing the neighboring Bentley Bay Condominium Association also on West Avenue, said her Board supports a 44-story building. She said she would go back and ask for specific direction on the height but added, “I’m sure everyone would agree a higher-end project is better… and if they need the height to get a higher-end building, I’m sure everyone would be fine with that." Ron Starkman, a South of Fifth resident said his building, the Portofino, a luxury building, is 44 stories with 10-foot ceilings. He urged the City to do more work on valuation of the taller tower and the benefits being proffered by the developer. After surveying the Committee on what was doable, Alemán put forth a recommendation for 44 stories at 11 feet “and no more than 484 feet” in height which the Committee agreed to send to the Commission for referral to the Planning Board, the next step in the process. Galbut asked for an additional 10 feet to allow for the tall lobby and amenity space but was rebuffed by the Committee. The ordinances will require a 6/7th vote of the Commission.